A nurse's cap is not typically worn every day, but it represents a very dignified profession when it is earned. It's an intermediate project for costume-makers. Children who dress up for play and Halloween love pretending they are a nurse. 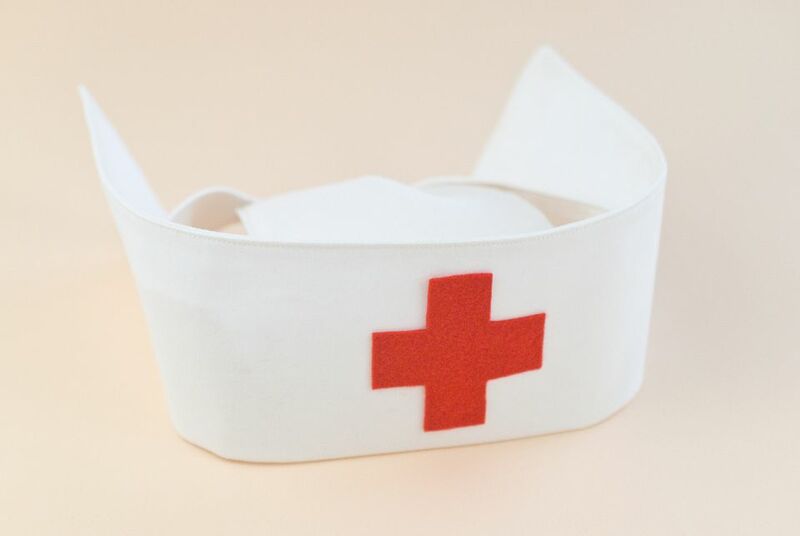 Make this nurse's cap to encourage children in their dress up play! You can even shrink down the measurements to sew a tiny nurse's hat that will fit an 18-inch doll! Nurses caps are typically starched, but this one uses stabilizer to keep the front edge standing up. Although many caps have colored stripes on them, nurses earn that stripe upon graduation from their course. Cut the fusible interfacing into two 12x20-inch pieces. Iron them to the back of the white fabric. Cut two rectangles of stabilized white fabric that each measure 11x19 inch. Cut a 5x7-inch rectangle out of the two lower corners of each piece. The 7-inch side of the cut out pieces should be along the long edge of the rectangle. Note: If you are making this hat for an 18-inch doll, cut 5x8-1/2-inch rectangles and cut out 2-1/4x3-inch rectangles from the corners. Sew around all of the edges with a 1/4-inch seam allowance, leaving a 3-inch opening on the bottom of the "T" shape. Turn the hat right side out and roll the seams between your fingers to open them. Iron the cap, including the opening, making sure that the seam allowance is pressed in evenly. Top stitch around the edges with a 1/8-inch allowance. Fold the "T" edge up so that the horizontal edges are 1-inch below the long edge. Press with an iron. Fold a small pleat in the "T" shape and sew it with a horizontal line. Bring the inside corners of the long edges to the back of the cap. Pin them in place at a slight angle near the bottom and the pleat. Sew the corners with small vertical lines. Cut a 2-inch square of red felt and cut a 1/2-inch square out of each corner to make a cross. Attach the cross to the front of the hat with fabric glue. Note: If you are making a doll hat, start with a 1-inch square and cut out 1/4-inch squares from the corners. Traditionally, a hat like this would be held in place with hairpins. If you're making this for a child's costume, a doll, or if you just want to skip the hassle of hairpins, add a thin elastic chin strap. Put the cap in place and measure the elastic based on the head size of who will be wearing it, cutting it a little shorter so it can stretch when worn. Sew the ends to the sides of the hat. Your nurse's cap is ready to wear!